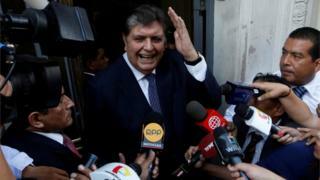 Peru&apos;s former President Alan Garc�a has shot himself as police came to arrest him. Mr Garc�a is accused of taking bribes from Brazilian construction company Odebrecht - claims he has repeatedly denied. Health minister Zulema Tom�s said Mr Garc�a&apos;s condition was "very serious and critical", and that he had to be resuscitated after suffering three cardiac arrests. "Let&apos;s pray to God to give him strength," the former president&apos;s lawyer Erasmo Reyna reportedly told journalists at the hospital. But Mr Garc�a says he is the victim of political persecution, writing in a tweet on Tuesday that there is "no clue or evidence" against him. Peru&apos;s four most recent presidents are all being investigated for alleged corruption, with a fifth - Alberto Fujimori - serving a prison sentence for corruption and human rights abuses. And the current leader of the opposition, Keiko Fujimori, is also in pre-trial detention on charges of taking $1.2m (�940,000) in bribes from Odebrecht. Published on Wed, 17 Apr 2019 13:01:05 GMT, © All rights reserved by the publisher.